Dr. Scott Zukowski received his PhD in English from Stony Brook University and currently works for CELT. 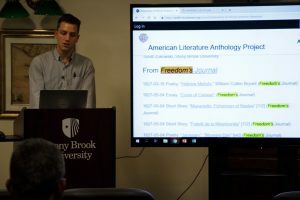 He presented some of his work with digitized periodicals, emphasizing the importance of these resources for understanding the formation of group identity, and as a way of gaining access to works which have been very little studied. This corpus includes voices which are often suppressed by the mainstream literary and historical canon. 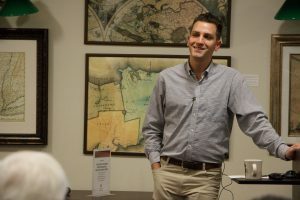 Dr. Zukowski’s talk was well attended by faculty and staff and inspired a discussion of how primary texts are read, taught, and collected. 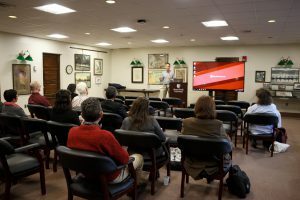 Dr. Zukowski is currently working on a repository of nineteenth-century African American newspapers.